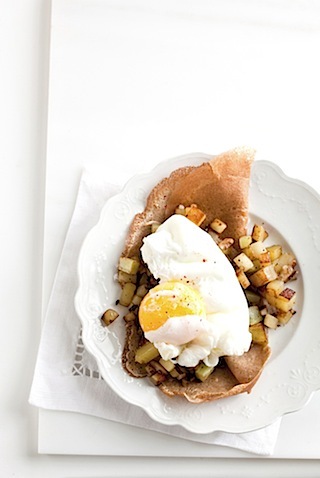 The crepe is the Joy of Cooking buckwheat crepe recipe with a little less all purpose and a little whole wheat pastry flour. The hash is quick saute of yukon gold potato, broccoli stem & button mushroom in a very hot pan. Top with a poached egg, salt & pepper. Although it looks a bit “steppy” this would actually be an easy brunch for a group of people. The crepe batter can be made the night before (and kept covered in the refrigerator overnight… it needs at least an hour rest anyway). Chop the veggies (it helps to parboil the potato so it sautes quickly), and have them ready to go. Make the crepes while the water heats for the eggs, and set them aside. 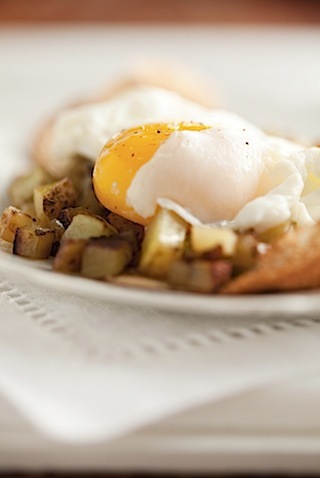 Poach the eggs and let them sit with a drizzle of olive oil in a warm spot near the stove, while the pan heats for the hash. Then quickly saute the veggies, and assemble. Oh this looks like super crepe to me! Love awesome breakfasts that can be prepped overnight. The poached egg is the icing on the cake! Creps! mmmm! aunque me gustan mucho más tus doughnuts!!! You hit it on the head. As a Dietitian, I hear so many excuses about how long it takes to make dishes at home. However, as you’ve pointed out in the last paragraph, it can be to the contrary. All you need to do is plan ahead, and the prep can be a breeze — even allowing you to make such a great entree for a brunch or breakfast get-together! I can even see folded ham and swiss with greens or mushrooms as part of a lunch or supper get-together! Every time I see a recipe for crepes I think back to being in Paris. This recipe sounds really good. Lara, When I saw how much you appreciated how nicely broccoli stems dice up, I had to write you about our website, ExpendableEdibles.com. My buddy Marlene and I created this site to fill a niche for gourmet recipes that rescue “perfectly good food”. We have one whole section devoted entirely to Stems, Skins & Stalks. Would you be open to sharing your recipe with our readers and get into a little more detail about how exactly you prepared the stems? Write me and also send along your byline and a little intro about how you feel about “expendable edibles” in general. Potato with eggs, i like this healthy combination as my breakfast. Thanks for sharing this delicious recipe.